Mick knew he had to do something, and 6 months later called Tempt’s father and promised that he would figure out a way to get Tempt to not only talk again, but also be able to create art. He had committed blindly because he knew this was something bigger than himself. He knew he had to commit, then figure it out. Mick offered his own home to host a group of hackers for a weekend long hackathon to develop a solution. At the end of the weekend, they had a prototype. A set of cheap sunglasses, bought at the Venice beach boardwalk, combined with some wire and webcams. The new piece of technology, named the Eyewriter, could follow the eye and use blinks to write out letters. With some help from guys at Graffiti Research Labs, and after breaking into a used car lot next to Tempt’s hospital, the team was able to project what Tempt was drawing onto the side of a building in real time using the Eyewriter. After this, some people from Dell got involved, but after further models failed, they backed out. However, neither Mick nor Tempt quit, and eventually Tempt was able to figure out how to use the original eye writer to not only draw, but actually design sculptures. 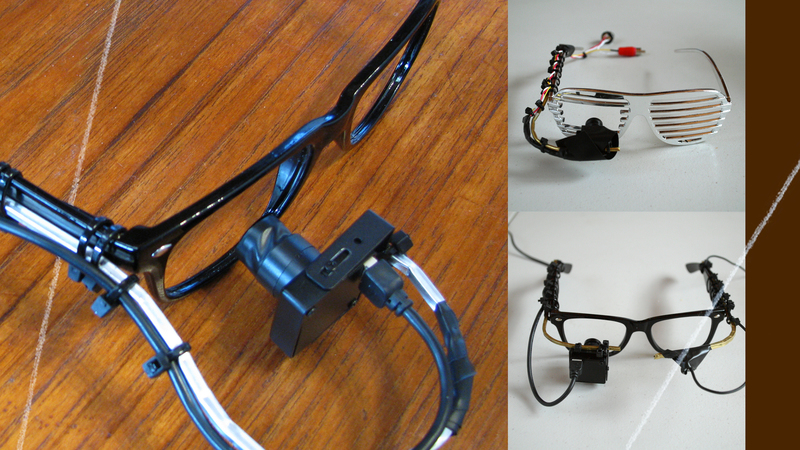 Q: How did you continue to push forward after the failures you faced throughout the process of creating the Eyewriter? ME: We didn’t see it as failures. The goal of having Tempt be able to communicate again and to be able to draw, that was what we were going to do. We knew that it was possible. It wasn’t like we were trying to figure out how to harvest minerals from Mars. That’s never been done before and is a conceptual theory. As for Tempt and that solution, we saw it had been done in other places. We just had to figure out how to do it better, faster, stronger, cheaper. Part of what pushed us through failing was just imagining going back to Tempt and saying, “yeah sorry Tempt, we couldn’t figure it out. You’re not going to draw. Sorry. You’re not going to be able to communicate again. You’re not going to do that.” You’re not going to say that to someone you promised all of that to. That’s the whole commit and figure it out way of thinking. If you truly, truly don’t allow yourself the opportunity or even a remote chance of thinking that failure is an option, then it just changes the way that you think, it changes the way that you operate. Q: How can people who are reading about Not Impossible find their “one”? ME: I think it’s just understanding the concept of the one. That is, when you think about the world, you think about the problems that exist in the world. You think about massive issues: global poverty, malnutrition, hunger, malaria, etc. For a normal human being, it’s an insurmountable thing to even fathom that you can make a difference. So when thinking about these issues in terms of one person, you think, “All I’m going to do is I’m going to focus on trying to help one person.” Now all of a sudden it gives you this hyperfocus and this hyper context. You get the euphoria of actually doing it, and it makes it quantifiable and achievable. If you just help one person that’s amazing. You’re propelling the world forward. Just do that. Just start with that ,and then go from one to the next one, or from one to two. Then you start to go from there. It’s opening your eyes to the possibility of just helping one person and letting that be the catalyst to doing more. Q: What advice would you give to someone who is scared to commit to a daunting task? ME: Imagine you’re sitting at your own funeral. What are people going to say? “Oh there’s that one time that Mick thought he could do something, but he was a little scared. He didn’t think he was qualified, so he didn’t go for it.” Or, they could say, “He tried. He tried as best he could to do it. He did or didn’t do it, but he went forward with a sincere and earnest desire to try to make this change.” So I think you write your own eulogy. No one’s going to keep tabs of the things that you never tried. People are going to keep tabs on the things that you tried. Some you will succeed at, and some you will fail. But I think what makes up who you are as a human being and how you exist on this planet is what effort you actually put forward. Q: Why do you think so many people believe change must happen at a higher level and can’t be done by individuals? ME: I think most people have given themselves over to the bureaucracies or the institutions and they feel insignificant. What they forget is that those institutions and bureaucracies are made of human beings and that it is the sum of the parts. Margaret Mead has this amazing quote, “Never doubt that a small group of thoughtful, committed citizens can change the world. Indeed it’s the only thing that ever has.” If you think that the government, the institutions, the hospitals, the universities, or whatever, is not going to give you the permission to go do what needs to be done, then you’ve forgotten the fact that all of those are made by individuals. So you’re just one of them. So just go forth and try. Go forth and do something. There’s this thing called permission. The second somebody takes something and just pushes it, they don’t even have to push it over the edge but just nudges it from the realm of impossible into possible, it gives everybody else permission to go do it. If everybody else says, “Wait a second, they pushed it even two degrees forward,” then someone else can go, “well I can push it two degrees more.” It’s just this idea of disempowering the thought process that we have to be part of this greater something to let us go do good and say no we can go do this good ourselves. To learn more about Tempt’s story and committing, then figuring it out, listen to episode 3 of the Not Impossible podcast. Visit us again next week for another story that challenges you to do more than just live, but to Thrive!